Takashi Miyoshi as known as “Yoshi“ is the only Japanese manager in the history of Japanese baseball and US professional baseball without playing in NPB (Nippon Professional Baseball) and MLB. He has been managing and coaching in pro level last 10 years in US. And “Yoshi“ is also became first Japanese coach who signed with Minnesota Twins in MLB. Kenshoku Takubo as known as “Kenny“ is first Japanese player who signed professional contract in the history between Hrosi Brno in Czech Republic 2012 season. And Kenny also have played in 6 different country (Japan, US, Canada, Australia, Czech Republic, and Austria) and 3rd base coach for Austria National team 2014 to 2015 season. Taira Uematsu became first Japanese bullpen catcher for San Francisco Giants since 2008. And Taira already has won 3 World Series ring with Giants 2010, 2012, and 2014 season. 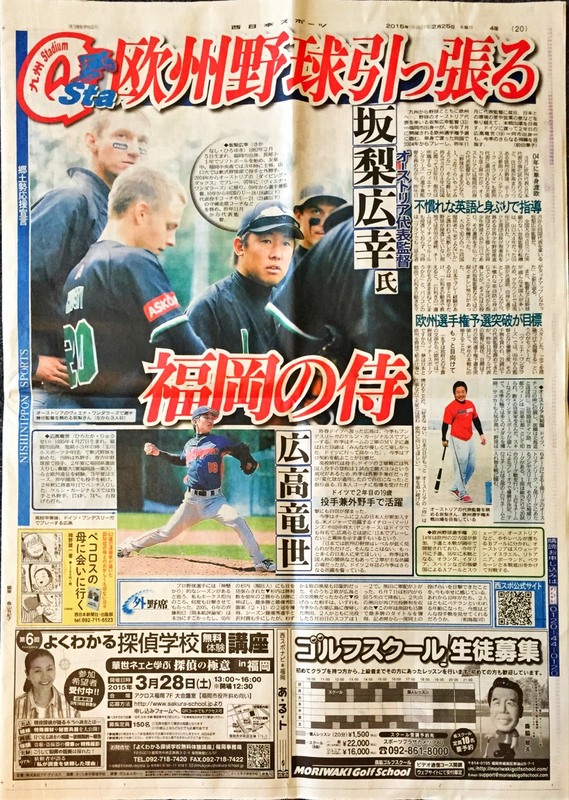 Hirotaka Shimizu as known as “Hiro“ has been playing baseball all over the world. Played in 5 different country such as Japan,Taiwan, Canada, Australia, and China. And Hiro is first Japanese position player who played in Chinese Professional Baseball for Shisen Dragons 2005 season. Yusuke Inoguchi as known as “Guchi“played in high school World Series in Japan and he has been playing for Baseball Challenge League (Japanese professional independent league). And he was selected RBI leader 2007, 2008 season and became season MVP player 2009 season. Guchi also played in US independent league baseball. He set up career high 18HR last season in Baseball Challenge League. Koji Hida played in Baseball Challenge League (Japanese professional independent league) for Gunma Diamond Pegasus. And also played in California Winter League. Great defensive player. Yuki Yasuda is playing for SouthernMaryland Blue Crabs in Atlantic league in 2018. And also played for Sonoma Stompers in Pacific Association Professional Baseball League 2015-2017. Yuki won “Gold Glove“ award in 2015 and won “Championship“ in 2016 season. Toma Furuichi played in Baseball Challenge League (Japanese professional independent league) for Niigata Albirex Baseball Club and also played in California Winter League. Yuji Nerei is first Japanese position player who reached as high as 3A level in U.S professional baseball without having experience playing in Japanese big league. He played professionally in 5 different country for 14 teams such as U.S, Mexico, Canada, Holland, Japan. Hiroyuki Sakanashi as know as “Hiro“ as a Japanese player and manager is pioneer in Europe baseball. He has been playing and managing for Vienna Wanderers since 2007 season to this year. He has won 3times championship in last 10 years. And he is also first Japanese manager to lead and manage the Austrian National team. Hiro is such a huge part of developing Austrian Baseball. Mitsuhito Oshima is underhand pitcher who played in Independent Professional baseball. He played in Shikoku Island League and Kansai Independent League. Now, he is a store manager of “Hoshiguki Batting Cage“ in Chiba Pref in Japan. Yu Hiraizumi played in Baseball Challenge League (Japanese professional independent league) for Shinano Grandserows and Ishikawa Million Stars. And He also played in Kansai Independent League for Osaka Hawks and Yamato Samurai Reds and was player/coach for Yamato Samurai Reds. Yu is currently working for Fukushima Hopes in Baseball Challenge League. Masahiro Miyadera played for one of the top school in Japan “Keio University“and also played in US, Canada, and Australia. Ryota Yamamoto played in Shikoku Island League Plus (Japanese professional independent league) for Kagawa Olive Guyners and he was a part of member for Japanese Independent League Championship team 2007 and 2008 season. He is currently owner of LTS Big1 Baseball Academy in Takamatsu-city, Kagawa Pref. Hiroshi Shimauchi Played in High School Baseball World Series “Koshien“ in Japan. And played for Tenri University Baseball team and went to play for Mik House in industrial baseball league. He singed first professional baseball contract in Canada 2003 season for Trois Rivieres Saints. Ken Hagishima played in high school World Series in Japan and played for Dokkyo University baseball team where he hit 25HR for his 4years in school. He also played in FedEx baseball team in Japanese industry league and managed team in 3 years after his playing time. Ken is also president of B. B. CLOVERS sports management office. Yuya will bring tons of baseball experiences and knowledges about the game and he also has a lot of knowledge about mental training for baseball players. Masahisa Morita as known as “Masa“ played in US summer league for “Eau Claire Cavaliers“ 2011 and 2012season.